Over the past twenty years, the Centre for Crime, Justice & Victim Studies (CCJVS) has firmly established itself as a national centre of excellence in criminal justice research. Founded in 1997 as the Centre for Criminal Justice (CCJ), the centre was rebranded as the Centre for Crime, Justice and Victim Studies (CCJVS) in 2015 in recognition of its significant research strengths in the area of victims’ rights. The centre is directed by Dr Susan Leahy and Dr Andrea Ryan. At present, the centre is comprised of fulltime staff members in the School of Law, fulltime researchers and PhD candidates all researching cutting-edge topics that have practical significance for the challenges posed in the modern criminal justice system. The key research areas that CCJVS members focus on are Criminal Law, Evidence and Procedure; Victim Studies; Youth Justice; Hate Crime; European Criminal Justice; Regulatory Crime; and Offending and Desistance. Centre members are actively engaged in high-quality, funded national and international research projects across these key areas. They are also heavily involved in the development of law and policy, with members regularly making contributions to law reform debates as well as providing training and development opportunities for criminal justice stakeholders. For example, the training programmes for An Garda Síochána is accredited by the School of Law, with CCJVS members sitting on the quality assurance board for Garda training programmes. 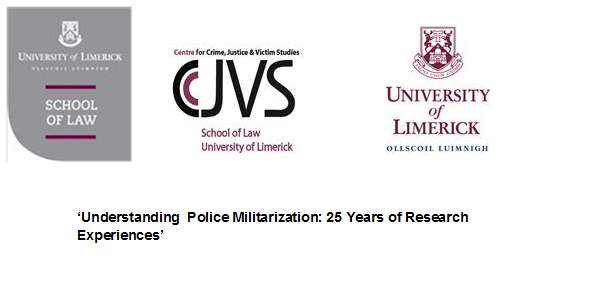 The CCJVS runs regular seminars and conferences that are attended by and involve contributions from key national and international criminal justice stakeholders and academics. We also host a blog, Criminal Justice in Ireland, that provides regular contributions from centre members and visiting academics. For further details on the work of the centre and/or queries about getting involved in our work, please contact Dr Susan Leahy at susan.leahy@ul.ie. The Criminal Justice in Ireland blog is hosted by the CCJVS and is co-ordinated and edited by Dr Ger Coffey. The blog features regular posts on all aspects of criminal justice, with posts typically released on the third Wednesday of every month. CCJVS members regularly contribute posts on their recent research activities, providing an excellent means of keeping up-to-date with the ever-developing expertise within the centre. The blog also includes contributions from visiting scholars and other scholars and practitioners associated with the work of the centre. We also welcome contributions from criminal justice researchers and practitioners on any area of criminal justice.